For over seven years, THE ADDRESS Magazine has been an internationally respected luxury lifestyle guide to living the good life. THE ADDRESS is an elegant lifestyle publication celebrating the best of architecture and interior design throughout the world. From the gracious homes of Andalucia to the high-end resort communities of Phuket, the glossy magazine combines inspiring imagery, informative features and tactile experiences of some of the world’s finest properties for sale. Covering everything from exotic long-haul trips to destinations much closer to home, each issue of THE ADDRESS Magazine checks into some of the most interesting, fascinating and beautiful locations in the world. The magazine also inspires foodies and each edition features profiles and interviews with a leading chef, plus two signature recipes. Moreover, the luxury magazine brings its top picks when it comes to food, living and well-being; both new finds and old favourites. The latest issue of THE ADDRESS Magazine presents 436 gorgeous, full-colour pages brimming with inspiration and information where a broad range of international luxury property and lifestyle markets are explored. A private island can be what real estate specialists call the ultimate trophy asset – and with the demand for properties rising worldwide, there is a lot of competition for such prizes these days. Representing one of the finest real estate offerings in the world, this issue features a very rare opportunity to own a trophy private island in the Mediterranean. Just off the Ibiza coast, it boasts postcard beauty and serenity along with great accessibility. As one of Europe’s most cosmopolitan cities, Lisbon is an up-and-coming destination to buy property either as second home, rental investment or for permanent living. Lisbon real estate remains an excellent long-term property investment. The range of property for sale is as diverse as the culture and architecture: traditional city apartments for sale in Lisbon Old Town; sleek modern riverfront flats and penthouses to buy; classic and stylish apartments to buy in the central Chiado district; contemporary and sleek ocean view apartments for sale in sought after coastal towns such as Estoril. Phuket is unquestionably Asia’s most desired holiday home location. Natural splendour, gorgeous beaches, superlative boating, top-end marinas, first-class golf courses, excellent infrastructure and a strong design aesthetic that is both ecologically sound and architecturally luxurious help create a desirable lifestyle. From ultra-exclusive resort communities – including an oceanfront Amanpuri villa for sale – to contemporary penthouses, the selected Phuket properties for this issue combine timeless elegance with peerless, refined style. Barcelona already has an international reputation for quality of life, architecture, style, culture, health care and schooling, and in recent years has been attracting an increasing number of foreigners buying property in the city. 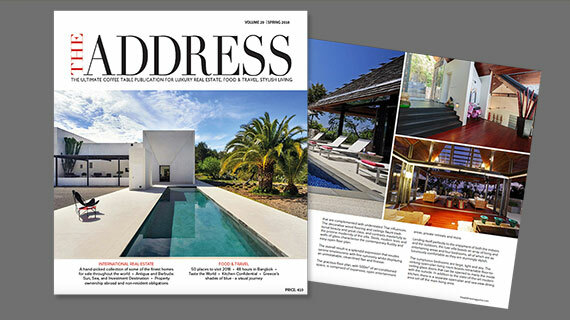 This issue of THE ADDRESS Magazine showcases an impressive range of luxury Barcelona homes for sale including classic apartments in modernist buildings in Eixample, modern flats in Diagonal Mar, stylish homes in the most exclusive residential areas of Barcelona – Sarrià-Sant Gervasi, and a glorious beachfront villa in Gavà Mar. The colourful and exotic city of Marrakech in Morocco is becoming increasingly popular with overseas investors as more people realise what the city can offer them. With a unique location, Marrakech offers more than a touch of exoticism and romance, with its old souks, fascinating Medina, and ancient buildings as well as cutting-edge art galleries and exquisite boutiques. From their unparalleled design to superb presentation, each of the selected villas in Marrakech showcases carefree, luxurious living at its finest. Representing the perfect opportunity to achieve your Caribbean dream, do not miss our fine selection of Barbados beachfront villas for sale. Also, this issue of THE ADDRESS Magazine features a strikingly contemporary villa in Andalucia, a modern beachfront villa in Brazil, a beautifully presented ski property in Bad Kleinkirchheim along with several other fine homes for sale. The market insight features in this issue include “Global Residence and Citizenship” and “Gibraltar Residency Compelling Advantages from a Tax Perspective”. THE ADDRESS Food & Travel section features fascinating travel destinations, luxury getaways and incredible restaurants with a difference. The article “Best of Europe” features our Top 15 picks for where to go in Europe 2015. It is the year to explore the eye-catching jewels of Rome, Seville and Istanbul, or inspirational gems such as Malta, Montenegro and Liechtenstein. “The Spectacle of South Africa” is a super article and a must-read for anyone travelling to this spellbinding country. South Africa revels in its diversity: a place where untamed wilderness meets lavish comfort, and a ‘Rainbow Nation’ of cultures rolls out a stunning variety of welcomes. From iconic safari lodges and breathtaking beaches, to sparkling coastal cities and world-class vineyards, South Africa really does have it all. Award-winning chef Davide Scabin sits down with THE ADDRESS Magazine to talk about food inspirations, highlights of his distinguished career, favourite ingredients and much more. Spacious family villa for sale in the upmarket area of Sant Cugat on the outskirts of Barcelona. 550m2 of luxurious living space. This exceptional ocean view villa for sale In Eze strikes the perfect Riviera note of refinement, glamour and elegance. This upscale family home in Phuket is the embodiment of supreme exclusivity and timeless grace with its Thai architecture, stylish decor, modern touches and distinctive charm.